Anthony's Home Studio: Alyssa Grey - Mixcraft Featured Educator of the Month! Alyssa Grey - Mixcraft Featured Educator of the Month! As the winter trade show season winds down (NAMM, IMSTA, SYNTHPLEX), it has not been lost on me the great fortune bestowed upon me year after year working with so many super-talented friends and associates in the music industry. I am humbled by so many cool people I get to hang out with, including Grammy winning artists and nominees, genius software and hardware developers, creative graphic artists, award-winning product designers, and exceptionally talented synth, preset, and loop music-making sound designers. With all that said, it was at TMEA (Texas Music Educators Conference) in San Antonio where I was lucky enough to find this month's featured artist, "Mixcraft Educator of the Month - Alyssa Grey". As it was in this instance, often it is that unplanned moment of trade show booth nirvana where a music demo turns into something much more. Alyssa's body of work as a music educator, clinician, conductor and performer is clear evidence of her gifted and learned talents, and the passion she has for her craft. How's this for a musical resume? Alyssa earned Bachelor's degrees in both Music Education and Music Theory/Composition from the University of Miami in Florida. She studied Music Education with Joyce Jordan and Nick DeCarbo and Composition from Grammy winning composer Lansing McLoskey. Her master's degree is in Music Education from the Eastman School of Music where she studied with Chris Azzara and Richard Grunow. "There are so many important concepts my students can learn throughout the film score process. I only had a few projects my first semester teaching the class but I quickly ran into a problem. The same students wanted to take the class again, some of them up to three times! I constantly had to create new material to keep them engaged. One thing that was really successful was creating a form they could fill out where they proposed their own project and grading criteria. I would then approve or give them revisions for the proposal before they could begin. While most students preferred to do the "regular" projects, advanced students or those with specific interests could take their own path. I always begin a new semester on day one by having students watch the Mixcraft Quick Start Guide. I ask them to split screens and pause the video to try each new idea while they watch the tutorial. We frequently reference the Mixcraft Youtube channel for new ideas and tips." Attention Mixcraft music educators, Alyssa has graciously allowed us to share her Mixcraft "Everybody was Kung Fu Fighting" project worksheet, timeline sheet and teacher's guide documentation for your classroom purposes. Download the documents here. 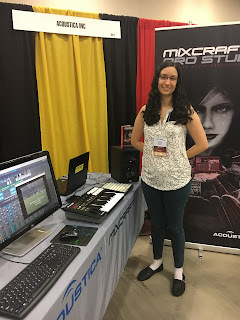 Editor's note: Thank you Alyssa for stopping by the Mixcraft booth at TMEA and for letting us share your story with Mixcraft users and music educators. Hope to see you next year!